Drinkwater goes on to say that policymakers need to increase incentives that reward environmentally beneficial farming practices. Currently, direct payments to farmers focus on production outcomes and do not sufficiently emphasize environmental stewardship, she added. Department of Horticulture graduate student Sam Bosco (right) is one of 24 Cornell students attending the United Nations Framework Convention on Climate Change – Conference of Parties 16 (UNFCCC COP16) to be held in Cancun, Mexico, November 29 to December 10. “One of our goals is to inform the Cornell community about what is going on at the COP and be able to have people at Cornell ask us questions that we seek answers to at the convention,” says Bosco, who is blogging about his experiences at 2sidesofCOP16. To find out more about Cornell’s delegation and to pose questions for them to investigate, visit the Cornell University – COP 16 page at Cornell’s Atkinson Center for a Sustainable Future website. “I’d like to thank the Atkinson Center for a Sustainable Future for providing the financial, academic, and creative support that has allowed so many varied people to attend,” says Bosco. Garden-Based Learning Program staff member Christine Hadekel has continued her commitment to empowering people through gardening while working on her Master of Public Administration with a concentration in International Development Studies. Caption: Christine Hadekel with schoolchildren in Kitui, Kenya, summer 2010. 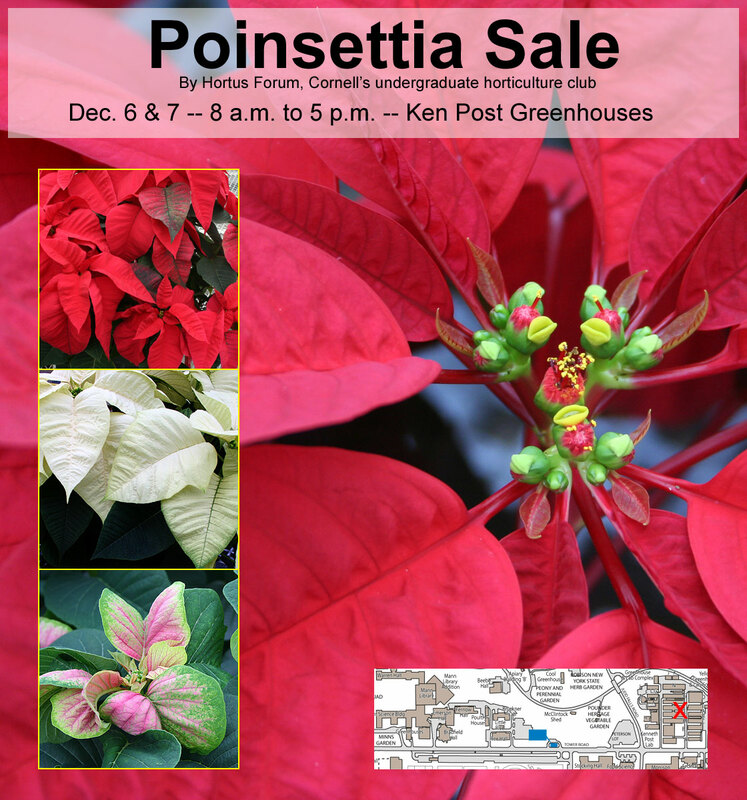 On-campus delivery of orders of 5 or more plants available for extra charge. If you have questions or would like to pre-order, contact Heather Lee at heatherhalee@gmail.com. Proceeds help fund Hortus Forum’s educational field trips and other activities. A meeting with Senior Associate Dean Jan Nyrop to discuss the teaching functions of Cornell’s greenhouses will be held Nov. 17 at 4:30 p.m. in 404 Plant Science Building. 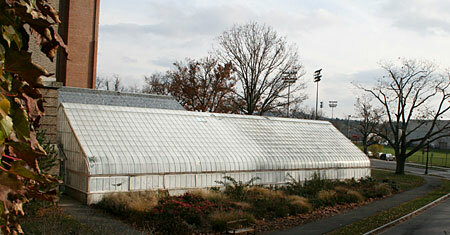 In 2008, the college sought to restore the Conservatory Greenhouse. An architectural firm specializing in preservation and restoration and specialists in greenhouse and conservatory preservation were retained, funds were set aside and bids requested. The bids received were dramatically higher than the college’s original estimate of $1 million or even the consultants’ revised estimate of $1.8 million, coming in at around $2.3 million — or more than $600 per square foot. Currently, CALS has a critical need to renovate or replace 65 percent of the college’s greenhouses, and the college’s administration is considering how to meet the need for a conservatory in the context of CALS’ overall greenhouse needs. Jules Janick ’51 was one of five outstanding College of Agriculture and Life Sciences alumni honored November 5, 2010, at a reception and dinner at the Statler Hotel. Janick, who has been at Purdue University since 1951, is widely regarded as one of the world’s most highly respected and best known horticulturists. He has led a distinguished career and continues to teach undergraduates, edit publications in horticulture and plant breeding, and participate in research on fruit breeding and horticultural history and iconography. Among numerous honors, in 2009 Janick was inducted into the American Society for Horticultural Science Hall of Fame—the society’s highest honor. From Eveline Ferretti, Mann Library. Cornell is hosting the 2nd annual Local Food and Fiber Fair from 1-7 pm on Thursday, November 18 in the lobby of Albert R. Mann Library. The fair’s goal is to build connections and raise awareness about the variety of activities on- and off-campus related to local and regional agriculture and food systems, and their links to healthy and resilient individuals, families and communities. All events are free and open to the public. Lightning Presentations and Networking, 1-2pm, Room 160 –Participating presenters will share brief descriptions of their work and activities in supporting sustainable agriculture, food systems, rural economies, and community nutrition. Food & Fiber Market, 2:30-6pm, Mann Lobby –An open market that celebrates the bounty of the Ithaca area, featuring displays by Cornell and Ithaca-area programs that support sustainable local agricultural systems and healthy nutrition as well as local vendors offering a wide array of fresh, locally produced vegetables, meat, cheeses, honey, wool and other fiber products and more. Film showing, A Farm for the Future, 6-7:30 pm, Room 160 –The New World Agriculture and Ecology Group, the Development Sociology Graduate Student Collectivity and the Cornell Gourmet Club will be hosting a showing of the acclaimed BBC production exploring strategies for sustainable farming in a post-peak oil world. Discussion to follow….and local popcorn served! If you have any questions, please contact Eveline Ferretti at ef15@cornell.edu. Preference for funding will be given to international (non US citizen) graduate students with PhD research situated in developing nations, focused on environmental sustainability, food security, and organic production systems. Use of TSF funds is restricted to student living expenses during the international fieldwork, on-site research expenses and supplies, and essential travel for the proposed research or outreach activities. Successful proposals will be funded at a maximum of $5,000 for a one-year period beginning Feb. 1, 2011. The Department of Horticulture at Cornell’s College of Agriculture and Life Sciences (CALS) requests proposals from Cornell staff and students, Cooperative Extension educators, and New York organic farmers for innovative research, teaching and outreach projects in organic farming and food system sustainability. Use of TSF funds is restricted to student or staff wages and salaries, materials and supplies, essential travel, and other direct essential expenses of the proposed research, teaching or outreach activities. Develop, evaluate, strengthen, and disseminate knowledge about organic gardening and farming. Encourage and support systems-level studies on environmental and economic impacts, energy efficiency, social equality, and local or regional sustainability of organic farms and food systems. Improve and expand organic systems knowledge and information through the Cornell Cooperative Extension and Master Gardener networks, within Cornell’s teaching programs, and at farms, agricultural and food processing facilities, and family gardens throughout NY and the Northeast. Promote novel approaches for research, extension, and teaching programs that enhance the sustainability and knowledge foundation for organic farming and gardening. Projects involving Cornell undergraduate and graduate students, and organic farmers in lead roles. Projects that improve energy efficiency and sustainability of agriculture and gardening. Projects that investigate key ecological processes and environmental impacts of organic and alternative farms or food systems. Projects that promote carbon sequestration, soil and water resources, human and wildlife habitat, and other vital ecosystem services in farms, gardens, natural areas, and managed landscapes. CornellCast video by Charles Walcott shows how it’s made. Cornell makes about 2,000 gallons of cider a week. 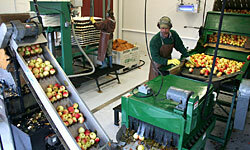 Fruit is picked from Cornell Orchards where it is sold fresh in the store or pressed into cider. The raw cider is pasteurized and bottled by Cornell Dairy in Stocking Hall. Nov. 4 CALS news release. See also Cornell Chronicle article. ITHACA, N.Y. – A new public-private organization based at Cornell University is being created to help produce growers and packagers promote safety and prepare for future federal safety regulations. Cornell, along with the U.S. Food and Drug Administration and the U.S. Department of Agriculture’s Agricultural Marketing Service announced the creation of the Produce Safety Alliance today. The three-year, $1.15 million partnership is funded by the FDA and USDA, and will be housed at Cornell through a grant from the Agricultural Marketing Service. Officials said the move will extend Cornell’s national Good Agricultural Practices program, which has been a leader in the development of materials on GAPs and in its dissemination of food safety knowledge to the agricultural community. Developing a standardized, multi-format and multi-lingual education program on good agricultural practices. Creating an information bank of up-to-date scientific and technical data related to on-farm and packinghouse produce safety; eventually including the FDA’s proposed produce safety rule. Launching a website to make the alliance’s work and information readily accessible. Establishing a network of educational collaborators. In 2011, the FDA is expected to issue a proposed rule on the safe production, harvesting and packing of produce. The alliance is aimed at giving produce growers and packers training and educational materials so they can learn about food safety best practices and future regulatory requirements. In addition to Cornell, the FDA, and the Agricultural Marketing Service, the alliance will have representatives from the Association of Food and Drug Officials, the National Association of State Departments of Agriculture, land grant universities, growers and shippers, produce trade organizations, and the USDA’s Natural Resources Conservation Service.